If you have remote users in your domain, they are not notified by the DC when their password is about to expire, because they open their windows session before the VPN client can connect to the DC. Here is a script that you can run daily on your DC to send an email to users from an OU, everyday for some days before it expires. So they know they have to change it before it really expires. objFile.WriteLine "Done. Finished at " & Now() & "." dp "The password for " & strName & " does not expire." dp "The password for " & strName & " has never been set." " (" & intTimeInterval & " days ago)"
dp "The password for " & strName & " has expired." iRes & " days from today)." dp strName & " needs an email for password change"
dp strName & " does not need an email for password change"
'Swap commented variable below to force email to be sent (for testing). dp Mid (objMember.Name, 4) & " has no mailbox"
strExpire = " for " & iResult & " days." objMail.Subject = "[IMPORTANT] :: The Windows password of " & Mid (objMember.Name, 4) & " is going to expire"
GPT partition style has been introduced to expand the limitations of the MBR (2TB). If you wish to install a system on a 8TB partition for instance you need to create a partition on a GPT partition style of 8TB. Even Windows Server 2008R2 can only install on a MBR partition style, so up to a 2TB partition. So you will have to split your raid into 2 and have Windows installed on the first and have data on the second. So there is a lot of spare space on the first partition (system). Of course you can split into 2 partitions (system + data). So you’d better have 2 small disks in raid 1 for the system and then have multiple large disks for data. Be aware that NAS servers are usually sold with a bunch of large disks. "The SharePoint item being crawled returned an error when attempting to download the item"
It turns out the start page of the root site contained a search result webpart which was causing the crawler to abort the rest of the crawl. This issue has since been fixed in a hotfix. Install the latest CU to solve the issue. A new feature of SharePoint 2010 allows you to publish your content types from one central hub to Site Collections that choose to subscribe to them. The site collections that are then supposed to use the content type hub will need to activate the site collection feature “Content Type Syndication Hub”. I installed the new Beta of Internet Explorer 9 and really liked the idea of pinning an IE tab to the taskbar. To test it I pinned the Facebook homepage to the taskbar and noticed when I right-clicked it, I also had four “Tasks” in the jumplist. In the above example, the name that shows up in the jumplist is “Documents” and it links to “http://intranet/docs”. I used the standard SharePoint “favourite” icon but you can link to any you like. 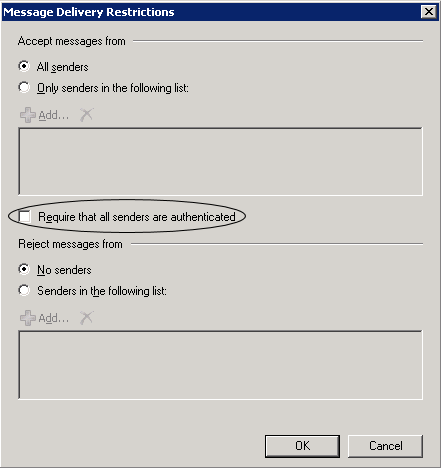 Relaying emails from an internal sendmail server to an Exchange 2007 transport server will work for AD users recipients, but not for AD distribution lists. 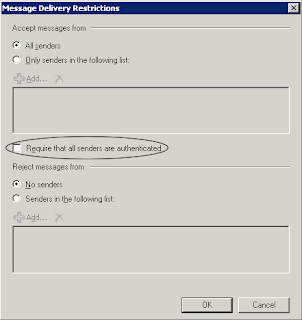 Edit the distribution list property in the Exchange Management Console, mail flow settings tab, Message Delivery restriction and then uncheck "Require that all senders are authenticated. A cool new feature of Exchange 2010 allows you to send text messages from your OWA or Outlook 2010 client. You will also need a Windows Mobile phone connected to your Exchange 2010 mailbox. WM 6.1 should download an update from the Exchange Server to enable this functionality (I haven’t tested this) whereas WM 6.5 can do this out of the box. It basically works by syncing the SMS to your phone and your phone then sends it out. When setting up the partnership between your Windows Mobile phone and Exchange you should see the option to also sync your text messages. Once you select this you will need to restart Outlook 2010 after which it will show you an additional item under “New Items” called “Test Message (SMS)”. Incoming texts will also land in your Exchange mailbox. It is worth noting that I wasn’t able to add the SMS syncing after I had created the partnership with Exchange – I had to remove the partnership and recreate it. I needed to create a list which would show a Yes/No column as traffic lights. Since SharePoint already has the necessary images from KPI lists I decided to use them. For those of you using various regional versions of SharePoint, be careful with the commas after “TRUE”. You might need to change them to semi-colons. The problem with the result from the above calculated column is that it is simply displayed as text. While trying to get it to display as an image, I stumbled across this site, and in particular a script which does exactly that. The script can be downloaded from here. I have added it below for the sake of simplicity. This script needs to be added to the bottom of the page using the Content Editor WebPart (add it by using the source editor not the Rich Text editor). It can be very useful to see how many active connections you have on your SharePoint server. This can be easily done using PowerShell to look at the IIS performance counters. As is mostly the case with scripting, somebody has already done a much better job than I ever could. Here is a script which creates a PowerShell function Get-WebServiceConnections. As an administrator, you would like to know more information when a virus is detected on your Exchange organization than the default message. Here you will find the list of keywords that can be added to your message template. When using BackupExec to save all your data, the xml logfile can be huge, hundreds of MB or more. Then BackupExec cannot display the result and it is really hard to find the reason of any issue encountered. I found this freeware : XML Marker which works pretty good with a 700MB file (you can start searching the file even if not finished loading). After installing the first Exchange 2010 Server in an Exchange 2007 environment, I noticed the public folders weren’t replicating. Even after adding a number of replicas the hierarchy wasn’t even showing up. After much searching I found this comment in a blog entry with the solution. Basically, it was due to an object still remaining in Active Directory from Exchange 2003 days. In this container delete the object “Servers”. After a little waiting, all was back to normal. The Exchange 2007 File Distribution Service is responsible for keeping the OAB on the CAS in sync with the mailbox server. The default setting only polls the OAB every 8 hours. This could mean that a change you make doesn’t make it to the Outlook clients until well over a day (if you leave the OAB creation to the default once a day)! When your exchange 2007 organization have multiple servers, since roles should be splitted on different machines, and you need to reboot them, it appears that sometimes emails are blocked. This can come from the Hub transport server and even if the MS Exchange transport service is set on automatic, is appears not started after reboot. Just start the Microsoft Exchange Transport service, and all emails will be released. It could happen that one of the storage processor of your SAN displays as unmanaged in GUI. This can happen after a SAN reboot and is usually related to the UPS powering this SP. Since the communication between the UPS and the SAN is broken (not available), the SP goes on unmanaged and disable the cache. In order to solve this, you'll need to stop the SAN (and everything running on before), stop the UPs, restart the UPS and let it do the check opreations (< 1 minute), and finally start the SAN. If you create a web part page in MOSS 2007 it won’t show the Quick Launch on the left side of the page.